We’re remodeling our entire home at the moment (pregnancy induced nesting instinct gone arguably awry), and I haven’t been living there since January. Homesick doesn’t even begin to describe the feeling. The white oak floors were finished while we were in Japan which means that while I can’t move back into the rest of the house (no sinks or showers! ), I can move back into my work space: the kitchen. These roasted banana & buttermilk cupcakes with Lindt LINDOR truffle filling & fluffy marshmallow frosting (a.k.a. 7 minute frosting) is the first recipe I created in my own kitchen since being back, and they’re a celebration of both truffles (tomorrow is national truffle day!) and of the comforts of home. Bananas roasted with cinnamon, sea salt, a few pats of butter, and a light sprinkling of sugar and a cup of local, full fat buttermilk are the secret to these perfectly moist cupcakes. They’re made extra special with the addition of a LINDOR truffle in the center of each one, making these a treat to eat while still a bit warm as the truffles create a “molten cake” effect. The classic milk chocolate flavor (in the iconic red wrapper) is a no brainer, but I love mixing it up and using different flavors (I like their create you own mix bags) so that each cupcake is a surprise. My favorite flavors for these cupcakes are coconut, white chocolate, and caramel & sea salt. Especially the coconut! The frosting is hands down my favorite frosting for anything be it cake, cupcake, or some such other frosted creation. It works particularly well here because the addition of the truffles makes the cakes very rich, so a lighter frosting makes more sense. 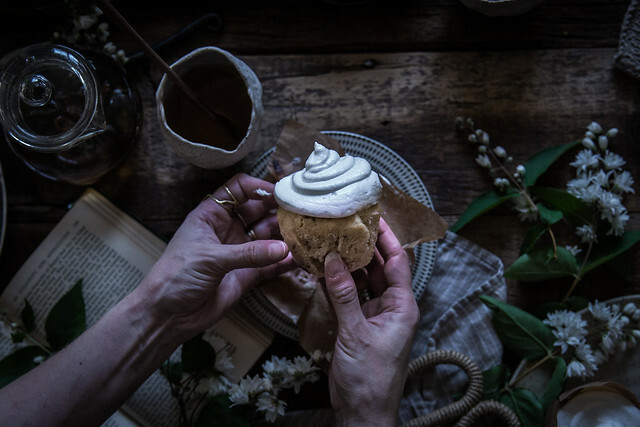 My favorite part about this frosting (other than the heavenly texture) is that if you’re so inclined you can infuse it with just about any flavor you dream up since the base is just egg whites and simple syrup. I think a rum-ified version of this frosting would probably go over well for an adult twist. The frosting also toasts really well, and that would be a great option here too. Just pop them under the broiler for about 30 seconds, but be careful not to burn them! The frosting is just meringue (whipped egg whites) that are then “cooked” by adding a bubbling hot, 240°F simple syrup to them. This results in a stable (excellent for topping pies) meringue that won’t weep, deflate, or give you food poisoning (hooray!) It’s very much reminiscent of marshmallow fluff, hence the name. And it’s super easy. I particularly like this method because it doesn’t involve whipping egg whites in a bowl balanced over a pot of simmering water which I find precarious and dicey. So you have the comforts of buttermilk cake, banana bread, molten chocolate, and marshmallow fluff all in one dangerously addictive cupcake. We brought them down to my in-laws for the weekend, and I’m not sure whether they wanted to thank us or curse us for bringing such tempting little sweets into their home. Suffice to say, none have survived the weekend. Though my husband and I are definitely responsible for a fair amount of the damage. I hope you enjoy these as much as I have! They’re a show stopper for get togethers, and perhaps some of my favorite cupcakes I’ve ever made. Ever. bake bananas 15 minutes or until the skins turn black then set aside until cool enough to handle. once cooled, scoop the bananas out of their peels into a small bowl and mash them with the back of a fork along with a splash of the buttermilk until they're very smooth. set aside. While the bananas bake, make your batter. First, whisk together the flour, baking powder, and salt and set aside. In a separate bowl whisk the eggs until they're pale and frothy, and then whisk the sugars into the egg mixture until there are no clumps and they're completely combined. Next, whisk in the canola oil and vanilla until they're completely combined. finally stir the banana puree into the egg mixture until evenly combined. divide the batter evenly between the 12 lined cups, and bake the cupcakes for 7 minutes. remove them from the oven and, working quickly, add one truffle directly into the center of each cupcake, pressing down very lightly until mostly submerged in the batter but not completely. place the cupcakes back in the oven and continue cooking for and additional 10-12 minutes or until they're golden, puffed, and a cake tester or toothpick inserted comes out clean. While the cakes are baking, make your frosting. In a small sauce pan combine the sugar, corn syrup, and water and heat over medium high until the sugar is dissolved and it registers 240°F on a candy thermometer. Stir occasionally in the beginning to promote the dissolving of the sugar and prevent burning. While the syrup comes to temp, beat the egg whites with the cream of tartar until frothy and forming soft peaks. With the mixer on low pour the hot sugar syrup down the side of the bowl (very carefully...you don't want to get spattered with this stuff!) into your whipped egg whites, and then increase the speed to high. Beat for about 7 minutes (hence "7 minute frosting"!) or until the bowl of the mixer is cool to the touch. I add the vanilla about midway through at the 3 1/2 minute mark. Frost your cupcakes once cool (if you try to put it on hot, the frosting might get a little melty, but we had no problem with slightly warm cupcakes). You can either use an icing bag, dollop it on with a spoon, or do what we did and cut the tip off of a ziplock bag and messily pipe it on since my icing bags are in storage somewhere! 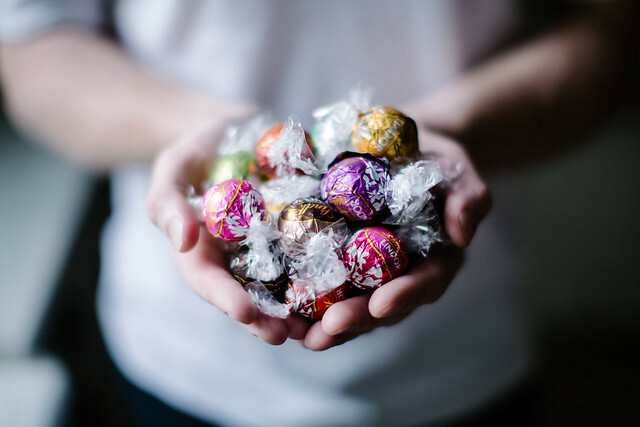 A big thank you to Lindt for sponsoring this post! All opinions, recipes, and photos are my own. oh wow, I saw these on snapchat and I was desperate to see what flavours they were. I have complete oven envy, yours looks amazing and these cupcakes tick all the boxes – especially considering they look muffin size. Also Italian Meringue is my favourite meringue so stable and easy to work with, despite that sugar syrup! This is the most amazing recipe I’ve seen in a while! These look divine! Def gonna try them out. The plates and little bowls in the pics are gorgeous. Care to share the brand or where they are from? These cupcakes look incredible. I’m going through a bathroom remodel right now. Construction has a way of making a home seem so foreign (and such a mess)! As always, your pictures are stunning! It’s in the ivory color! Great idea. Thank you for sharing. Amazing pictures. /i loved the cupcake paper tins. Where can I get them? I found them at Whole Foods! I’ll check the brand and let you know as soon as I get home. You can probably get them online too! Aiiiiieeeee, those bananas sound heavenly!!! Not so for the frosting, as I cannot abide meringue. I’m still searching for that perfect frosting that will make me happy. 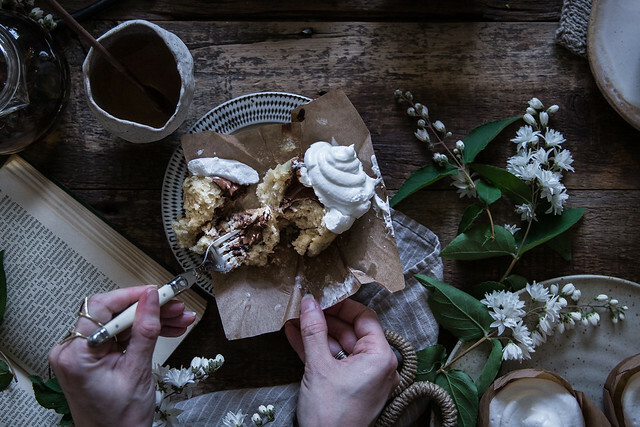 Love the whole mood of these pictures, there’s such a dreamy, romantic vibe to it that has me longing for lazy afternoons reading and doing nothing more than munching on tiny cakes like those!! I just……banana anything is my favorite. Egg white frostings are my mother’s favorite. I’m going to make these for us for Mother’s Day! You’re flipping incredible, Beth. Good grief. When’s the cookbook coming??? Such beautiful cupcakes! Marshmallow frosting is the best. I don’t even need to put it on anything. Hi Beth! These cupcakes sound amazing and the photos are beautiful as always. I feel you on the nesting-gone-awry. We were forced to clear out when I was 38 weeks pregnant due to some unforeseen home emergencies (that sort of spiraled out of control). We headed to my parents’ house, I went into labor the very next day and spent the first 7-1/2 weeks of our baby’s life there. It was not ideal but gave me a newfound appreciation for our space when we were able to get back in. So hang in there on the house stuff! You’ll be back before you know it. Lots of love to you and your growing family! Are you KIDDING me? Roasted bananas? I am dying for these. Must make them RIGHT NOW. I’ve always referred to seven minute frosting as Italian meringue, and have actually never thought to use it as a frosting. These cupcakes look fantastic, and like a combination of so many good flavors. I just made these and they are making my whole house smell amazing! Thank you for another wonderful recipe. One question… It seems I may have not waited long enough to add the hot liquid into the 7 minute frosting and it seems really liquified. Should I wait and see if it will pipe or should I start all over and wait longer to add the hot liquid to the whipped whites? Oh my! I’m just loving this post….bananas, chocolate, marshmallows….3 of my favorite flavors:) I know what I’ll be baking this coming weekend! Can’t wait to see the results of the remodel! It’s hard to imagine your h9me can become even more stunning than it is now. Wishing you a quick move back! And these cupcakes look like all my cravings in one recipe. OMG CHOCOLATE. I love the idea of warm molten chocolate when you bite into the cupcakes but would warming them hurt the frosting? I’m thinking of serving them at a dinner party. Any suggestions? 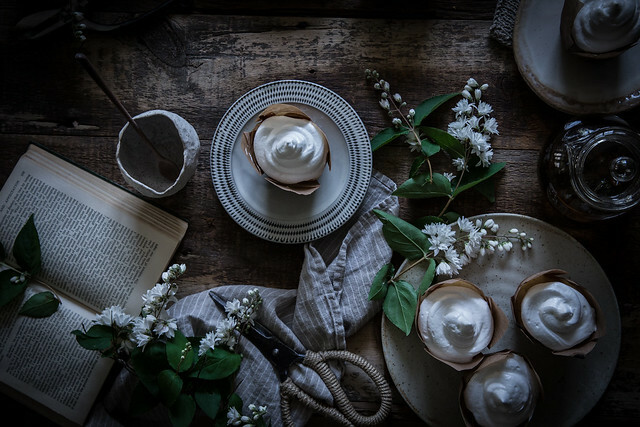 I would toast the meringue before serving, this will both warm the cupcakes enough to melt the chocolate and give the meringue a gorgeous look. I’d broil them on either the lowest rack or the middle rack *very carefully* to toast it…if you’re ADD like me I’d hover while they toast so as to not burn them cause that can happen fast in there! But it would be perfect. I’ve never wanted to make a cupcake so much in my life! These with be perfect with peanut butter truffles with the banana and marshmallow! Thanks for sharing! I cook more than I bake but you had me at “Bananas roasted with cinnamon, sea salt, a few pats of butter”! I want to taste that frosting now; you’ve described it so well! And I loved the picture of your chagrined in-laws you painted for us with your words. Food connects and good food makes memories! I HAD to make these immediately and began a hunt for Lindt truffles., which I found at my local Walgreens. Wow – these were delicious! And that’s saying a lot when, until now, I have been firmly in the “I don’t make cupcakes” category. Cakes? – yes, always, any way, but cupcakes? not my thing – until now. Thanks for a brilliant recipe – best 7 minute icing recipe ever. I always felt the same way! I was too good for cupcakes (hahahaha)….but these. Ugh. You’ve reminded me how much I want to make these again (and again). And I’m glad you like the frosting recipe! It’s my absolute favorite…seriously try using flavored syrups in it sometime! It’s infinitely adaptable. I want to make your cupcakes, but here in Europe we only have buttermilk with 1 % fat. Should I use regular milk instead? That looks amazing! Plus the photos are divine! I absolutely adore your food photos – they look like oil paintings! Am I the only one that sees a recipe for PISTACHIO POUND CAKE + STRAWBERRIES IN LAVENDER SUGAR on this page, instead of the buttermilk roasted banana cupcake recipe? Might be a database mapping issue… I’m dying for this recipe though! The pictures look beautiful! It was a glitch due to the new site launch and transfer! It’s fixed now. If you notice any more like it…please drop us a line! I can’t believe you fixed that so quickly – saved my birthday plans!!! Thanks!! !